A polar bear brought to SeaWorld San Diego when the park’s “Wild Arctic” exhibit opened in the late 1990s died Tuesday, and animal-rights group PETA blamed it on a broken heart. Park officials said a necropsy will be performed to determine a cause of death for Szenja, a 21-year-old female. “Szenja died of a broken heart, PETA believes. 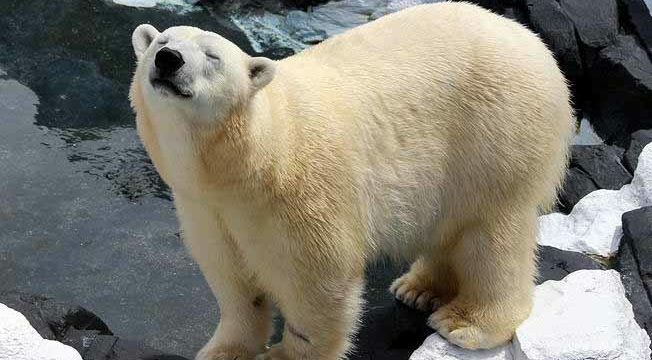 After losing her companion of 20 years when SeaWorld shipped Snowflake to the Pittsburgh Zoo in order to breed more miserable polar bears, Szenja did what anyone would do when they lose all hope, she gave up. Park officials said caregivers and veterinary staff noticed a loss of appetite and energy in the bear over the past week and were monitoring her condition. Even still, her death was unexpected, according to park officials. The average lifespan of a polar bear varies depending on the source. SeaWorld cites Polar Bears International’s estimate of 15-18 years in the wild, though a small percentage can range up to 30 years or so. “Szenja was a beloved member of our animal family, so this is a very difficult day for all of us,” said Al Garver, the park’s vice president of zoological operations. SeaWorld estimated that around 50 million visitors have seen Szenja at the exhibit over the years. She was also the subject of studies into polar bear hearing sensitivity, social habits, reproductive hormones and seasonal behavior patterns. Szenja was born at the Wuppertal Zoo, near Dusseldorf, Germany, in October 1995, and was brought to San Diego two years later.